When I spoke in Chicago, I suggested a reflective exercise – before you do anything, make a list of what you think/expect/hope to get out of it. Afterwards, make another list of what you did get out of it. Did you get what you wanted? If your after list was your before list – if you’d have known that you’d get these things – would you still have done it? And what was your unexpected learning? Unexpected learning can be one of professional involvement’s great gifts. Here are some of the things I didn’t expect to learn in Chicago. During conference, I did a book signing (of the New Professional’s Toolkit). Three people came. How did you read that sentence? What tone of voice did you hear me using? Resigned, depressed, self-deprecating? I mean, three people? That’s not very many, is it? That’s what I hear in my head when I say it. I mean, three people! Three people not only bought my book – TO READ – but cared enough to come and get it signed! One of them said she’d been looking forward to the book coming out since she’d heard me mention it in a talk at the 2011 SLA Conference. After she’d gone, I may have had a little cry. Would it have been ace to have queues of eager fans stretching right around the hall? Well, maybe (or not – the store only had 10 copies). But I really couldn’t have felt better about it than I do. The triumph was just doing a book signing. ‘Be an author’ has been one of my ambitions for as long as I can remember, and it finally, really came home to me there, sat behind that table, that I’d done it (with a lot of help from my friends). I was published, and I didn’t give a damn how many people came to get their book signed – I’d already achieved more than I’d ever thought possible just by being there. I could have happily sat there for hours. There. I’ve said it. I hate being on panels. I hate not being able to prepare what I’m going to say (oh, you can in a general way, but you can’t script – it’s hard to script in a way that fits the more informal discursive nature of a panel, and a pre-prepared script can’t take into account the ebb and flow of the discussion – oh, and you can guarantee someone else will nick your best points). I hate feeling like the dead weight, surrounded by supremely talented and eloquent people. I hate having to try to be intelligent, profound, and quotable off-the-cuff. I hate microphones. But I’ll keep doing them if asked (and reassure myself that I can’t be that bad, if people keep asking me). Why? Because they’re fabulous preparation for job interviews. If you can get through a panel without facially betraying how much you’re mentally berating yourself for being a blazing idiot who has no idea when to shut up, then you’re standing yourself in good stead for facing an interview panel. If you can face 50 people and manage to come up with something (vaguely) coherent when asked about problem-solving, you can definitely do it with 5. Admittedly, I’m not sure where ‘not accidentally strangling fellow panel members with a microphone cord’ fits into the interview scenario, but I’m sure it’s a valuable life skill. You know how you’ll be talking to someone while trying to sneak a look at their name badge, only to find out the lanyard’s twisted, and you can just see the blank back? And then you lose all chance of pretending you remembered their name from 2 years ago, and either have to admit defeat and ask or keep the conversation as non-commital as possible? Ok, full disclosure: I didn’t actually think of this until the last day of the conference, but I’ll definitely be doing it at conferences from now on! Simon Barron‘s third blog post about SLA Chicago deals well with the feeling of total immersion you get from SLA conferences – exacerbated for the non-US contingent by literally being in a foreign country. I’ve felt like that at every previous conference, but not this time. As my hotel room was the same price whether one or two of us were sleeping in it, my husband came out with me, in preparation for a post-conference holiday. It meant I found it hard to be entirely ‘professional Bethan’ – ‘holidaying Beth’ kept trying to creep in, and remind me that there was a world outside SLA. This might seem to be a good thing (for balance and whatnot), but it actually just made it harder to feel involved and to really feel in the conference vibe. I was disconnected from the tribe. I don’t think I’d realised how much I relied on conference to catch up with my SLA posse until this year. Not only did I have the clash of interests, I also missed some good friends and colleagues who couldn’t be there, and I think my conference experience was definitely the poorer for it. (Not that I didn’t have a fab time with the people who *were* there, but you know…) So that’s made me more determined to get along to some more SLA Europe events in person. I really believe that one of the rewards for involvement in a professional association is contact with the brilliant people you meet and work with, and that you owe it to yourself to make the most of that – so that obviously means I’ve earned more drinks with the SLA Europe folks, and deserve to put some effort into cashing (gin-ing?) that in. So would I still have gone to Chicago if these (along with realising I need to think more about learning outcomes and learning how to edit down a presentation on the fly) had been my projected learning outcomes? For personal development, definitely! But my ‘want to learn new skills’ nerve is still twitching, and I wish I’d put a bit more effort into making sure I scratched that itch, too. 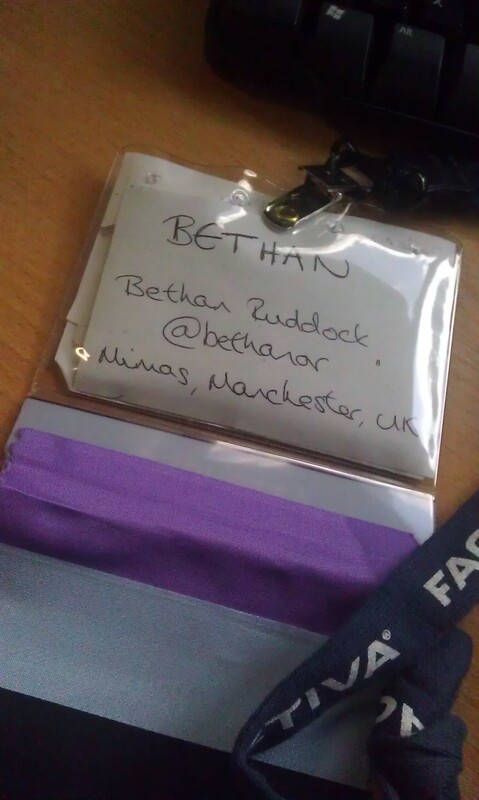 Oooh, that ‘writing on the back of the badge’ thing is pure gold! Thanks for sharing your experience, particularly about not being fully immersed because your husband was there. I had planned to turn ALA into a holiday this year but chose not to; partly for financial reasons and partly because of the immersion aspect. I actually really like being on my own at conferences – it takes me out of my comfort zone but in a good way as it makes me open to more opportunities for doing cool things. It’s good to hear your experiences though, this confirms what I had concerns about. I think in an ideal world I’d experience the conference on my own and then do the holiday thing afterwards. I find time alone necessary for reflection and also good to encourage me to meet new people. First book partner has written (though I’m told apparently it is technically a novella) is available from http://cjwalley.com/interstate-juggernaut. He seems to have really caught the bug and is writing another at the moment. You were brilliant on the panel – one of my best bits. I’m also proud to own a signed copy of your book. I’m not sure I could have had my husband along as I would have felt too guilty for leaving him. I look forward to seeing you at future SLA Europe events. Aww, thanks Sarah! Really glad you enjoyed it 🙂 It definitely was hard to go off to conference and leave J behind – even though I knew he’d be fine and would find plenty of stuff to do, I still felt a bit like I was abandoning him. He survived! Really enjoyed reading this Beth. Agree with Jo about how magnificent it is that you’ve got a book written and published. A book signing is the icing on the cake! As someone who heard your on the fly session at leadership orientation I didn’t perceive it to be a cut down version and you delivered it as eloquently as ever. Sometimes it helps to be out of your comfort zone! I wasn’t able to attend your panel event, but I’m sure it was great. You have a lot of insightful things to say. Like you I’ve not been too keen on panel sessions but am getting happier with them thanks to standing for election this year. Maybe it’s just a question of practice and talking about something you care passionately about. You’ve raised some interesting comments on bringing husbands to conference. It does make you feel torn between doing the conference experience and thinking about holidaying. I’ve found it works best in a city where family live so then your partner has some other people to chill out with and you don’t feel guilty for immersing yourself in conference. Thanks Kate! I think you’re right about being out of your comfort zone – it’s the only way you ever progress, though it might be tough at the time. You’ve been great whenever I’ve seen you on a panel, and I’d never have guessed that you weren’t too keen on them! I agree that practice is key – and I guess standing for election gives you lots of practice! And that’s an interesting idea about having family at conferences… Do you think I could persuade my in-laws to move to Vancouver in time for SLA2014? I can definitely see advantages in that!